The Bloody Palace has been a fixture of Devil May Cry ever since 2003’s Devil May Cry 2. It’s a mode that involves an exhausting climb through monster-filled rooms with hundreds of enemy arrangements and bosses along the way. But it’s also the best place to play around with combos test your skills in real-time. Devil May Cry 5’s new Blood Palace keeps the basic format, but adds extra variety with numerous characters and boss fights. Bloody Palace released today as a free update, bringing the series staple to Devil May Cry 5. There are 101 floors of enemies, each with their own encounter layout; players need to cut their way to the top. What makes Bloody Palace so appealing is how it highlights Devil May Cry 5’s combat while adding a slight dusting of puzzle-game seasoning. Every room is timed, and you receive a grade if you finish all of the fights. This means you’re constantly reminded of how quickly you have tackled previous levels and where you can improve. If you die, you have to start over at the bottom floor. The exciting part is being able to apply your previous knowledge to optimize each encounter and make more progress on the next go around. All three playable characters—Dante, Nero, and V— are available. You just one character per attempt; the Bloody Palace allows you to focus on whoever you prefer. As a result, it’s a good way to really chip your teeth and play around with Devil May Cry 5’s combat. The main story has a few challenging encounters, but the Bloody Palace is designed to surprise and break players. There’s a gentle difficulty curve, but as encounters start to vary, you’ll be forced to get creative in order to survive. You have one life in Blood Palace, and that added tension encourages the best possible gameplay. Over time, you’ll break down what works and what doesn’t. If you weren’t paying close attention to enemies’ quirks during your main playthrough, Bloody Palace will force you. I have complaints about Bloody Palace, but they’re the ones I’ve brought with me from the main campaign. The environment is boring, taking place almost entirely in the drab demon nest world that dominated so much of the main story. Devil May Cry 3 and 4 had truly palatial locations, using baroque and gothic aesthetics to full advantage. Devil May Cry 5 doesn’t have that luxury, meaning this version of Bloody Palace isn’t that easy on the eyes. Also, while I adore what the game’s designers pulled off with V and think they crafted a unique playstyle for his character, he’s just not as fun to take through the Palace as Dante or Nero. V works best in short bursts and in highly curated situations; otherwise, the seams start to show. Dante has various fighting styles that he can alter between to navigate different situations. 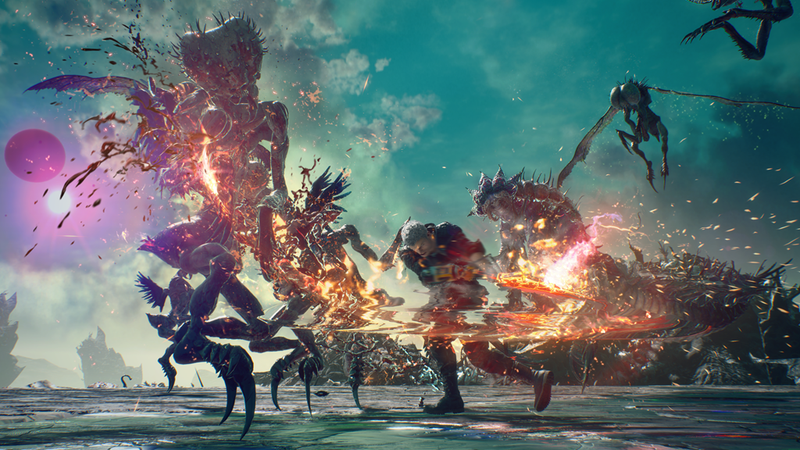 Nero has tricky timing-based combat and collectable Devil Bringers that can radically change how a player handles an encounter. V? He’s charming and fun to play for short periods of time, but I don’t know if I’m eager to climb with him all the way to the 101st floor when I could rage around as someone else. Bloody Palace is a simple idea: fight and fight some more. It’s Devil May Cry without the distraction of lore and drama. I love the franchise’s cheesy story and stylish cutscenes, but Bloody Palace is a chance to have a more pure Devil May Cry fighting experience. This version might be a little drab-looking, but the fights and boss encounters still shine. A lot of effort has gone into making Devil May Cry 5 responsive and easy to control. The Bloody Palace is a playground for pushing your skills to the limit and trying new tricks in pursuit of a delicious S ranking once the bodies hit the floor and the dust has settled.